Full worth of Diwali is recognized only with the presence of sweets and without relishing a mouth full of sweets diwali would become incomplete!sharing gifts and sweets brings prosperity and happiness and all through these festive days we are excited and over enthusiastic.Many forms of sweet gifts are in trend today that are modern and very different but traditional authentic sweets that are in regular practice is always something close to the heart. Sweet and savory preparations starts a week ahead before diwali mainly to gift neighbors, friends and relatives and in turn loads of gifts arrive home from their end!filling our tummies with full varieties of sweet surprises.Boondi ladoo, is a trademark special diwali sweet but making is not identical although the procedure is same!the way we make creates all the difference but it tastes just wonderful and it continuous to exist as top on the sweets lists.I loved these ladoo’s because of its crumbly texture all because of sugar syrup that holds the laddu’s and don’t fry boondi’s crisp as we do it for kara boondi just should be fried over on a high flame for seconds and remove it.Don’t try to shape ladoo’s when it is still hot shape ladoo’s when it becomes luke warm.I have made sugar syrup of single string consistency and if you make laddu’s with half string stage then the laddu texture will be different from the ladoo’s made from single thread consistency. Little ghee for frying cashews and dry grapes. 1.Keep all ingredients ready powder cloves and keep. 2.Then fry cashews in little ghee then add dry grapes till golden keep aside. 3.Keep two perforated ladles ready one for shaving off the batter and another for straining away boondi. 4.Take besan with a pinch of soda and sieve it add colour and add water to mix without lumps to a paste first. 5.Then add water little by little till you reach little thinner than bajji batter consistency. 7.Dip your finger in the batter and it should coat the finger. 8.The oil should be nicely hot keep ladle close to the oil pour batter with a ladle and with the same ladle press the batter in rotating motion so that batter drops down as perfect balls. 9.Wait for a second and immediately strain off the boondis in a tissue. 10.Repeat in the same manner till all the batter is used up. 11.Before starting the last round of frying itself start to make sugar syrup. 12.Keep a kadai with sugar add water to cover the sugar. 13.Let it boil and when white bubbles start check for 1 thread consistency(if your sugar contain impurities filter and then continue). 14.When single thread is formed switch off add edible camphor to it and stir well. 15.In between add fried cashew grape mixture ,cardamom powder to the fried boondi. 16.Take boondi in a large bowl and add sugar syrup to it mix nicely add sugar candy to it. 17.Wait till it become tolerable to handle to make a ball. 19.You can wet your hands in water then make balls it will be easy. 20.when making balls you will see oil oozing out which helps to make a perfect ball. 21.When all are made keep in an air tight container and enjoy. Keep all ingredients ready powder cloves and keep. Then fry cashews in little ghee then add dry grapes till golden keep aside. Keep two perforated ladles ready one for shaving off the batter and another for straining away boondi. Take besan with a pinch of soda and sieve it add colour and add water to mix without lumps to a paste first. Then add water little by little till you reach little thinner than bajji batter consistency. Dip your finger in the batter and it should coat the finger. The oil should be nicely hot keep ladle close to the oil pour batter with a ladle and with the same ladle press the batter in rotating motion so that batter drops down as perfect balls. Wait for a second and immediately strain off the boondis in a tissue. Repeat in the same manner till all the batter is used up. Before starting the last round of frying itself start to make sugar syrup. Keep a kadai with sugar add water to cover the sugar. Let it boil and when white bubbles start check for 1 thread consistency(if your sugar contain impurities filter and then continue). When single thread is formed switch off add edible camphor to it and stir well. In between add fried cashew grape mixture ,cardamom powder to the fried boondi. Take boondi in a large bowl and add sugar syrup to it mix nicely add sugar candy to it. Wait till it become tolerable to handle to make a ball. You can wet your hands in water then make balls it will be easy. when making balls you will see oil oozing out which helps to make a perfect ball. When all are made keep in a air tight container and enjoy. Always be careful if you are adding camphor if added more then whole recipe will be a mess and its optional. If you find the boondi forms tails then your batter is thick so add needed water and test till you get round boondi's. If the batter is too thin then you can always correct by adding more besan. The syrup consistency is important and you can make ladoo's by wetting your hands with water now and then when making ladoo's. Adding colour is purely optional. Oil should be nicely hot when frying boondi's and don't fry for much time other wise the boondi's will become crisp. When making balls the oil from the boondi will ooze and it will be easy to make the balls. 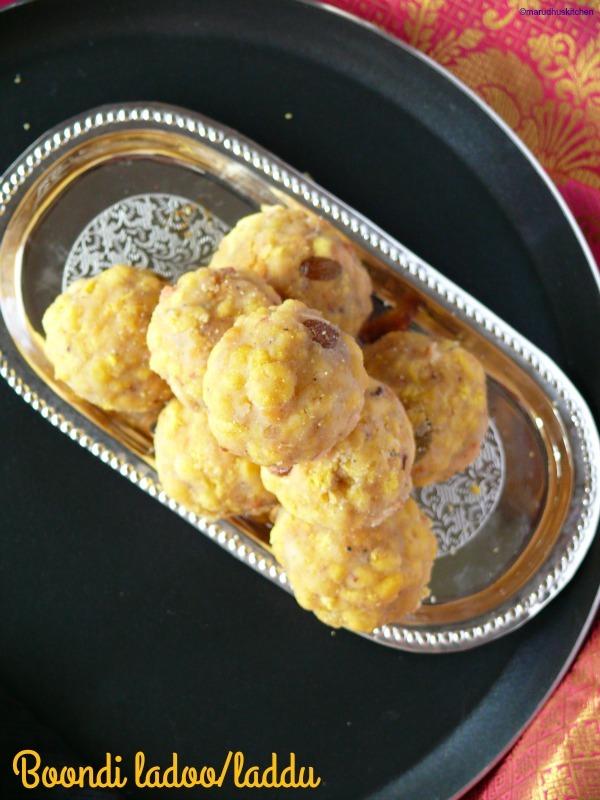 Awesome Boondi Ladoos..I always find them hard to make…but yours look perfect…Too good! Ragi Ladoo | LET'S COOK HEALTHY TONIGHT! Perfect boondi ladoos.. Thanks for step by step instructions..
Boondhi laddo is my weakness, I didn’t get time this time so not making, you made it so perfect, wish I can taste some. Happy diwali to you and your family. 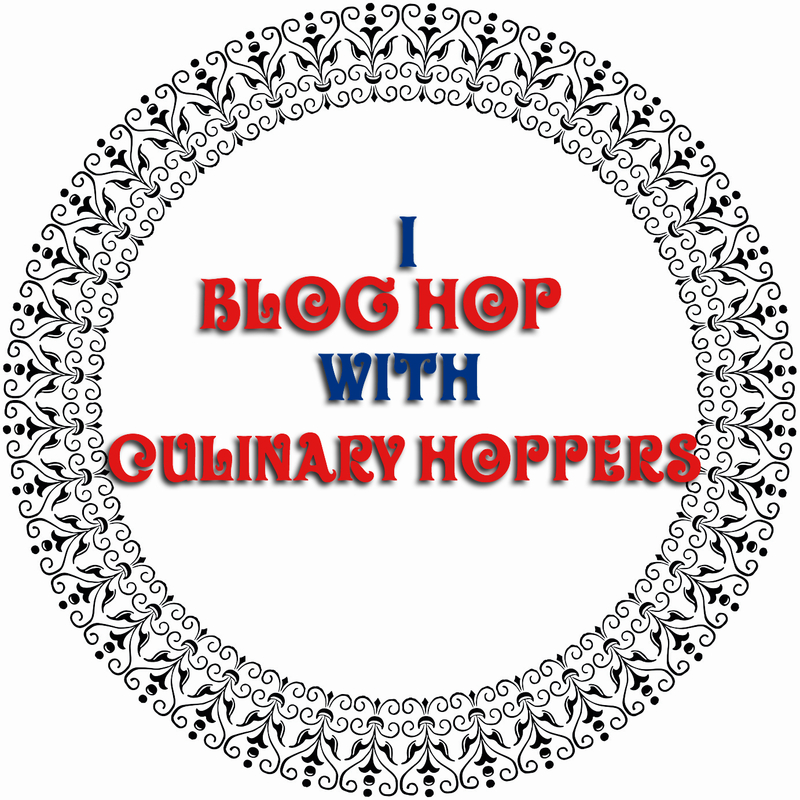 you bring such perfection to all your posts, the sweet boondi ladoos are no exception. love, love, love boondi ladoo 🙂 a must every diwali and when made with such perfection – they become irresistible. nicely explained post too. awesome! 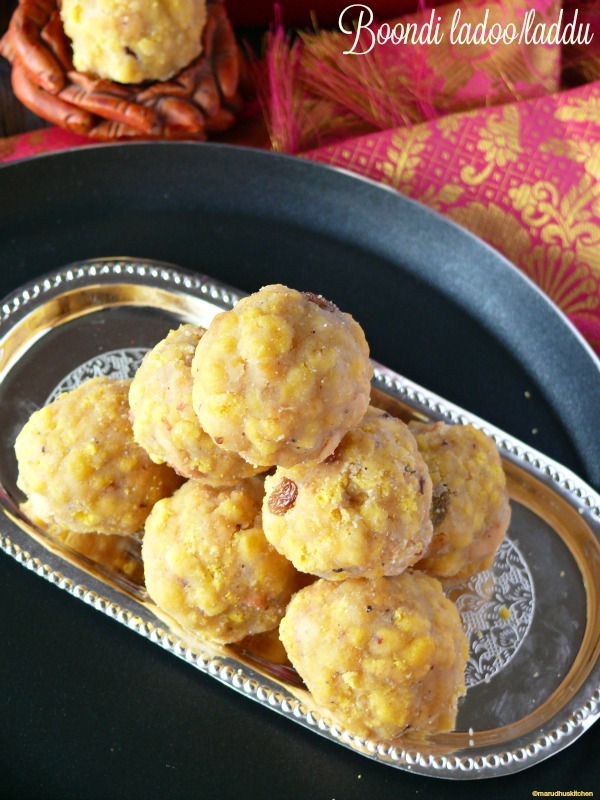 wow… Ladoos are looking perfect. These Ladoo are my family’s favorite sweet. Lovely Boondi laddoos, very nicely made, kudos to you Vani. Super! I have never tried making these, should make them some time..Happy Diwali to all of you !